Jan. 30, 2017 –In a new study led by Indian-American researchers at Brigham and Women’s Hospital, Harvard Medical School, suggests that microRNAs in the blood could serve as promising biomarkers for monitoring the progression of Multiple Sclerosis and could help to identify distinct underlying disease processes, such as inflammation and tissue destruction. A paper on the findings authored by Rohit Bakshi and Roopali Gandhi, both professors of neurology at Brigham and Women’s, was published in the Jan. 23 edition of the Journal of the American Medical Association Neurology. The study was conducted at the Ann Romney Center for Neurologic Diseases. The study found that serum microRNAs are linked to MRI findings in the brain and spinal cord in patients with MS. The study suggests that these links could be protective or harmful to patients (depending upon the function of the microRNA). They also found that different mechanisms were linked to different locations of MS changes, such as in the brain or spinal cord. Additionally, the study suggested certain sets of microRNAs were linked to lesions, while others were linked to atrophy, which is known to have more devastating effects. “These findings tell us the disease is heterogeneous. There’s a complex set of mechanisms at play, and it may vary from patient to patient,” Bakshi, the senior co-author is quoted saying in a Jan. 25 press release. Bakshi is the Harvard Medical School Jack, Sadie and David Breakstone Professor of Neurology at Brigham and Women’s. “Another implication of this research is that it could eventually lead to us having a blood test to identify the subtype of MS in a patient, to help guide therapeutic decisions and prognosis,” Bakshi added. “MicroRNAs could serve as biomarkers of the underlying MS disease processes, once validated and standardized for clinical settings. In addition, these markers have the potential to provide novel treatment targets,” said Gandhi, Harvard Medical School assistant professor of neurology at Brigham and Women’s. 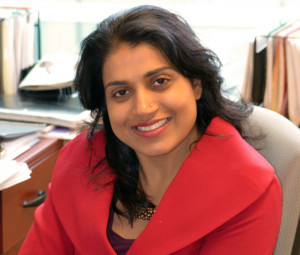 Bakshi, a Buffalo, N.Y. native, is also a Senior Neurologist at Brigham and Women’s Hospital (BWH). He is Director of the Laboratory for Neuroimaging Research at the Partners Multiple Sclerosis Center. He has built a research program involving quantitative MRI in MS through support from the National Institutes of Health, National Science Foundation and National Multiple Sclerosis Society. His group uses advanced MRI scanning and computer processing to understand mechanisms of MS at various stages. He has focused the importance of gray matter damage in MS as a new avenue to understand the causes of disease onset and progression. His work has also helped to define brain and spinal cord atrophy as major predictors of patient symptoms. In addition to his research and mentoring role in his lab, Dr. Bakshi cares for MS patients at BWH. He is a graduate of Cornell University. He has received numerous awards and has delivered more than 200 invited academic lectures and authored more than 200 peer-reviewed articles. Dr. Gandhi was born and grew up in New Delhi, and did her Ph.D. thesis work at National Institute of Immunology and Jamia Milia Islamia, New Delhi. She joined the Ann Romney Center for Neurologic Diseases in 2004 as a fellow and was promoted to Instructor in 2008. She was appointed as Assistant Professor in Neurology at Harvard in 2012. In the last ten years at Brigham and Women’s Hospital, Dr. Gandhi initiated several research projects related to basic immunology, autoimmune diseases and neurological disorders. Her research is focused on understanding the mechanism of cellular immunity, particularly, induction and characterization of regulatory immune cells and identification of a biomarker for MS, according to the Harvard Medical School website .